A Parliamentary report of 1776-7 listed a workhouse in Manchester accommodating up to 180 inmates. Also included were workhouses at Cheetham (25 inmates), Failsworth (20), Harpurhey (10) and Great Heaton (6). 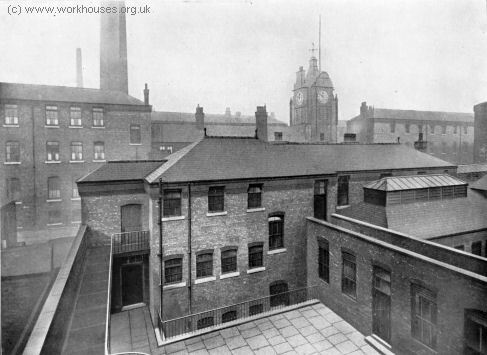 A workhouse was built in 1792 on New Bridge Street in Manchester. It was opened for the reception of the poor on February 14th, 1793. In this great manufacturing town the preservation of parochial records has been almost wholly neglected, and of course very little correct information relative to the Poor can be obtained. Manchester is much divided into parties respecting the administration of parochial concerns and strong charges have been made against many of the persons vested with the management of the Poor, who are maintained partly at home and partly a Workhouse, where there are at present 319 persons, principally old women and children. They are principally employed in winding yarn. Particulars of their work and diet could not be obtained as a malignant fever now rages with great violence in the house, and renders it unsafe to enter it. Manchester New Bridge Street workhouse from the west, 1820s. Manchester New Bridge Street from the north, 1816. ...a large, spacious and we may say fairly elegant building. It was erected in 1792 upon a very eligible piece of high ground near the influx of the Irk and the Irwell. The size forced the architect to make the walls &. massy. The degree of elegance which is shewn, was therefore of little cost. The mere disposal of the external parts was a matter of taste only; and the inside is admirably adapted for the purpose intended... In 1824, the building was coated with Roman cement, which has added very much to its appearance. A manufactory of cotton goods is carried on in the house in which the stronger poor are employed and the children are instructed in the arts of winding, warping and weaving... The average number of paupers of all ages, supported in the house, is from 350 to 400, whose board costs per head, from three shillings and six-pence to four shillings per week. That they obey the Governor and Matron in all their reasonable commands. That they demean themselves orderly and peaceable, with decency and cleanliness. That they never drink to excess. That they work from six o'clock in the morning till six at night, in summer; and from seven o'clock in the morning till such hours in the evening, as the Directors shall appoint, in the winter; except Saturday afternoons, from four o'clock; and on Good Friday, Christmas Day, and the two days following, and Monday and Tuesday in the Easter and Whitsun Weeks, which are to be regarded as Holidays. That they do not pretend sickness, or other excuses to avoid their work. That they regularly attend divine service on Sundays, and prayers before breakfast and supper every day. That they go to breakfast, and to supper, in the Dining-Hall, when summoned by ring of bell. That no strong or spirituous liquors be allowed in the House, except by order of the Physicians or Apothecary. That they do not curse, nor swear, nor lie. That they do not steal, sell their provisions, or sell or pawn their clothing, nor be guilty of any other breach of trust. That they never go out during working hours, nor at any other time, without leave. That when permitted to go out, they do not stay longer than the hour appointed. WHOEVER shall offend against the above Rules, will be punished either by confinement in the stocks, or in the dungeon, or elsewhere, or by distinction of dress, by abatement of diet, loss of gratuity, by such corporal or other punishment as may be determined and adjudged by the Weekly Board of Overseers, according to the powers vested in them by the Act of Parliament. The Rules shall be read to the Poor in the House by the Governor on the first Monday in every month. County of Lancaster: Blackley, Bradford, Cheetham, Crumpsall, Failsworth, Harpurhey, Great Heaton, Little Heaton, Manchester (13), Moston, Newton (in the Parish of Manchester), Prestwich. The population falling within the union at the 1831 census had been 164,130 with parishes ranging in size from Bradford (population 166) to Manchester itself (142,026). The average annual poor-rate expenditure for the period 1838-40 had been £34,173 or 4s.2d per head of the population. The growth-rate of Manchester in the 1840s led, in 1850, to the township of Manchester becoming a Poor Law Parish in its own right. The other members, covering an area to the north and east of the city, separated to form the new Prestwich Union. Below the bridge you look upon the piles of débris, the refuse, filth, and offal from the courts on the steep left bank; here each house is packed close behind its neighbour and a piece of each is visible, all black, smoky, crumbling, ancient, with broken panes and window-frames. The background is furnished by old barrack-like factory buildings. On the lower right bank stands a long row of houses and mills; the second house being a ruin without a roof, piled with débris; the third stands so low that the lowest floor is uninhabitable, and therefore without windows or doors. Here the background embraces the pauper burial-ground, the station of the Liverpool and Leeds railway, and, in the rear of this, the Workhouse, the "Poor-Law Bastille" of Manchester, which, like a citadel, looks threateningly down from behind its high walls and parapets on the hilltop, upon the working-people's quarter below. New fever wards were added to the buildings in 1851. By the 1860s, the New Bridge Street workhouse could accommodate 1,644 inmates. This workhouse assumes largely the character of an infirmary and hospital, with a fever hospital, venereal wards, foul wards, and wards for cases of special infirmity, arising from paralysis, &c., attached to it. There is a resident medical officer. As many as 674 patients are on his list at this time. The drugs, which are of the very best quality, are found by the Guardians. Some idea of the extent of the dispensary may be formed when it is stated that 1,000 bottles of medicine, and other things in proportion, are made up and supplied to the inmates weekly. I saw and conferred with the medical officer, who assured me that he had everything that he required for the use of the sick, and that be only had to make application to the Guardians for anything he wanted, when it was immediately supplied. Nearly all the beds, even for the sick, are of straw, though of course other beds are provided for particular cases. In visiting the sick wards, I specially and in the absence of the officer who withdrew at my request, inquired of each patient in a condition to understand and reply to my questions, whether he or she had any complaint to make either in regard to their food, their bed, their clothes, or their attendance, and whether generally they were contented and satisfied with what was done for then. The answers to my inquiries were (with hardly any modification) satisfactory in these respects. I found that the sick were duly supplied with the diet, wine, beer, spirits, &c., ordered for them by the medical officer. Not only were they generally contented and satisfied, but I run happy to add that many of them expressed gratitude for the care and attention bestowed upon them. There is, however, much dissatisfaction in regard to a portion of the diet. The pudding is considered hard and indigestible, and it is said to be absolutely rejected and wasted by a large number of the inmates. The rice as a meal is distasteful to many, whilst the pea-soup disagrees with some of the aged poor. The old women especially complain that their tea is not good of the kind, and that it is too weak. I tasted it myself and consider that it may well be improved in strength and flavour. I found the workhouse generally in fair order throughout, but some of the beds are too near together. Ventilation is especially defective in the Magdalen wards, and I am inclined to think that one of the old women's wards is too full. Many counterpanes in the sick ward require washing, and there is not a sufficient supply of towels, &c., in those wards. Prayers have not lately been said in the evening, and the chaplain's report book does not contain a report of the moral and religious state of the inmates of the workhouse. 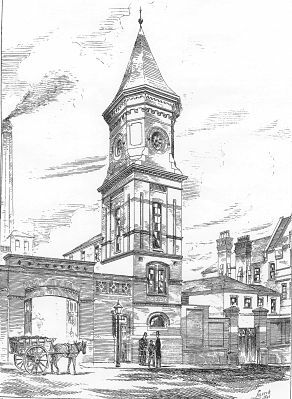 Manchester's aged and infirm remained at New Bridge Street until 1875 when the main part of the site was sold to the Lancashire and Yorkshire Railway for an extension to Victoria station. 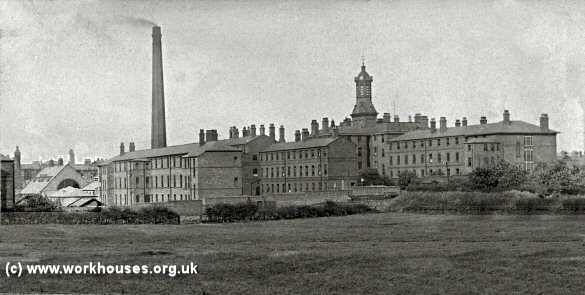 In 1881, the remaining part of the site was redeveloped with the erection of new casual wards, relief department, female lock (venereal) wards, lying-in wards, and lunatic wards. The New Bridge Street premises continued in use until the First World War when the War Office took over the premises. These were demolished in the 1920s to expand the Victoria Station's goods yards. New Bridge Street site, 1908. 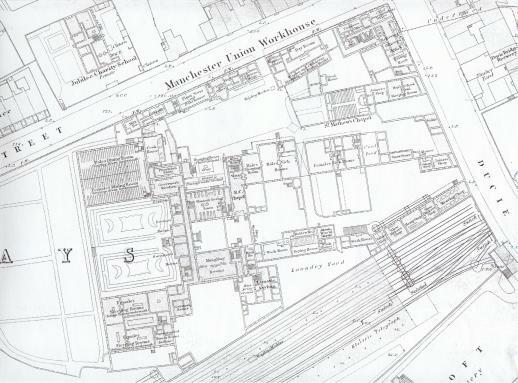 As well as Bridge Street, two other existing workhouses were retained by the Manchester Union as children's establishments. 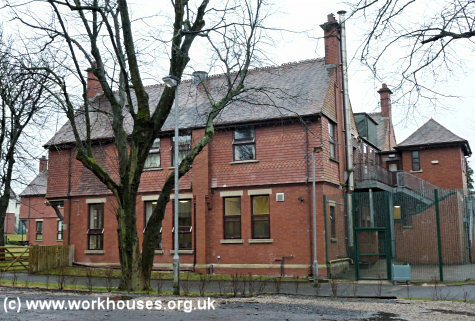 The former Blackley parish workhouse on Moston Lane was converted for used as a school for the union's pauper boys. Its location is shown on the 1848 map below. A small lunatic asylum was located to its west. Blackley workhouse boys' school, c.1848. In a similar manner, the old Prestwich parish workhouse at Rainsough was used as a residential school housing about 160 pauper girls. The Blackley workhouse closed in around 1845 after the opening of the Swinton Schools (see below) and was subsequently leased for use as a silk mill. The Rainsough workhouse was used for period to house adult inmates but was given up in 1847. After the formation of the Prestwich Union in 1850, Rainsough became the new union's workhouse. At the height of the Irish famine in 1847, Manchester experienced a large increase in poor relief claimants, partly due to an influx of immigrants and partly due to a widespread outbreak of typhus fever in the city. 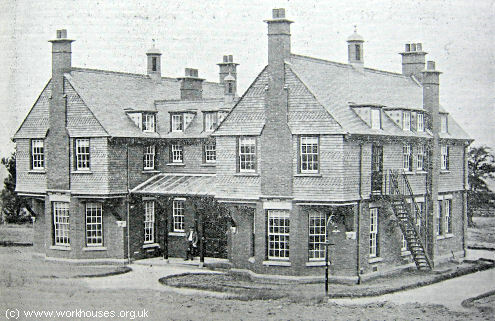 As a result, the Bridge Street workhouse could not cope with the demand for places and additional accommodation was needed. In January 1847, the union began leasing the former Barratt's mill premises at the north end of Tib Street as a temporary auxiliary workhouse for 600-800 inmates. The Tib Street workhouse, also known as the House of Industry, was mainly used as a 'test' workhouse for able-bodied men who were required to perform labour in return for poor relief. The workhouse was vacated in early 1851. Manchester Tib Street site, 1847. 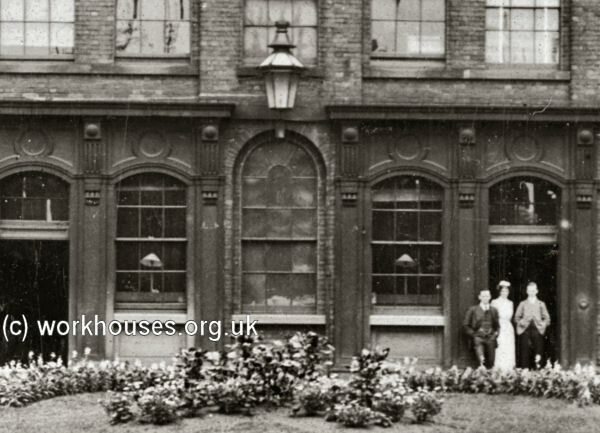 From July 1847, further workhouse accommodation was established in premises on Canal Street. This continued in use until October 1858 after the new workhouse was opened at Crumpsall. From about a year from July 1847, a temporary workhouse for about 200 inmates operated on Minshull Street. Over the same period, a temporary fever hospital was in use on Millgate — this establishment closed in June 1848. 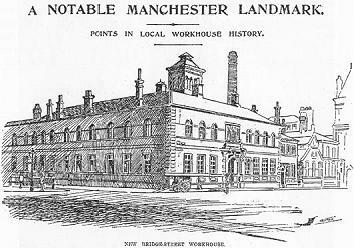 In 1855-7, the Manchester Board of Guardians erected a new union workhouse on an out-of-town site at Crumpsall, up the Irwell valley to the north of the city. The workhouse, designed by Mills and Murgatroyd, could accommodate 1,660 inmates, comprising: 745 able-bodied men and women; 152 women including 76 with infants; 248 idiots, imbeciles and epileptics; 255 children under 16; 60 probationers; 200 sick. 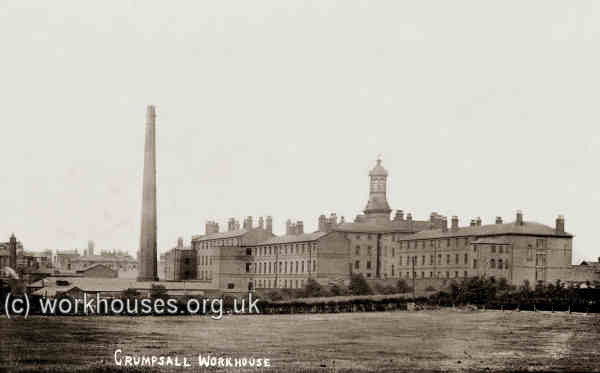 The first inmates at Crumpsall, in 1857, were able-bodied males who worked on the workhouse farm. Inmates only began living in the main workhouse from around August 1858. An good overall impression of the buildings is given by a model of the site. Manchester workhouse model from the south. 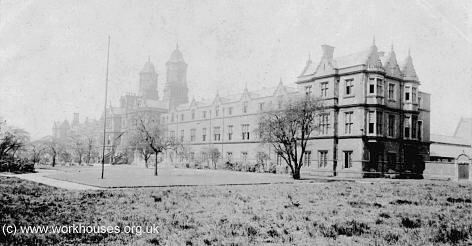 Crumpsall workhouse site from the west, c.1906. Between 1909 and 1920, new blocks were erected at the west and south sides of the workhouse, providing new inmates' dormitories and accommodation for imbeciles. The new block at the south, hiding the base of the chimney stack, can be seen in the picture below. Crumpsall workhouse site from the west, c.1915. The main entrance to the workhouse was via the block at the south-east where a porter's lodge was placed alongside a central archway. 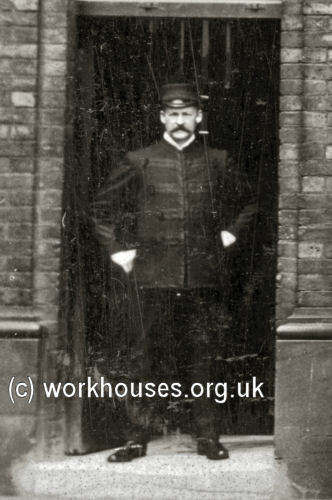 Manchester workhouse entrance block, early 1900s. © Peter Higginbotham. 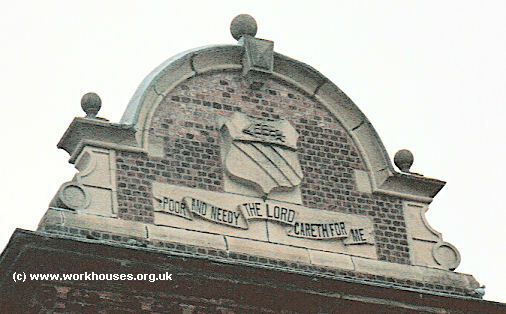 Manchester workhouse entrance block (detail), early 1900s. © Peter Higginbotham. To the rear, the main building was as large T-shaped block. Manchester main block from south-east, 2000. A link block containing the chapel led to two long parallel accommodation ranges. Manchester chapel (left) and accommodation block (centre) from the north-east, 2000. © Peter Higginbotham. Crumpsall was also visited by Poor Law Board Inspector Mr R.B. Cane in August 1866 at which time accommodation was provided for 1,963 inmates. He found it to be "...the most complete as well as one of the best managed work-houses that I have ever inspected. It is in thoroughly excellent order throughout, and generally in such a state as to reflect the highest credit on all concerned in its management and care." 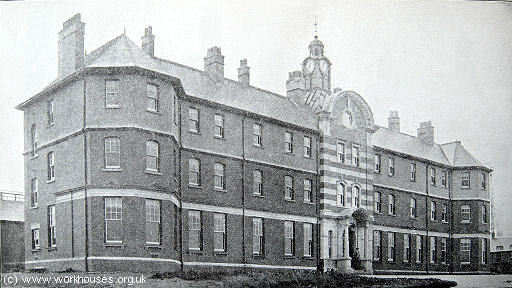 After the closure of most of the New Bridge Street site, a large pavilion-plan infirmary was erected at Crumpsall, to the north of the workhouse. 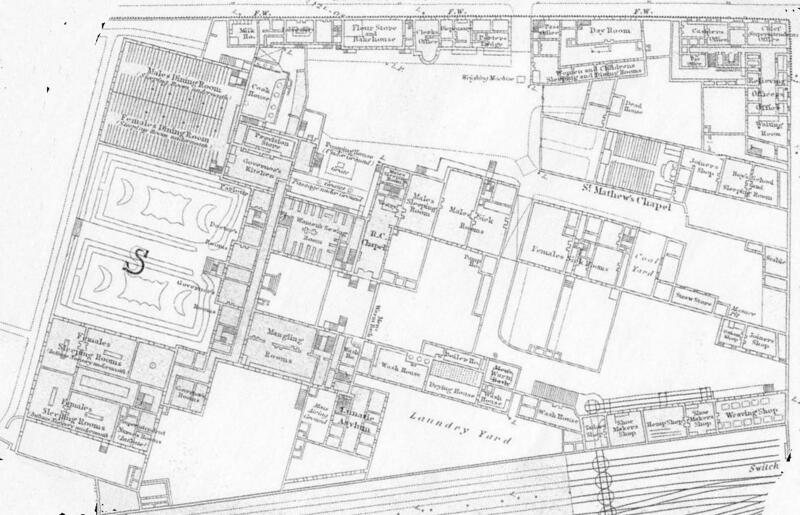 The 1893 map below shows the site layout at that time, with the adjacent Prestwich Union workhouse at the north. 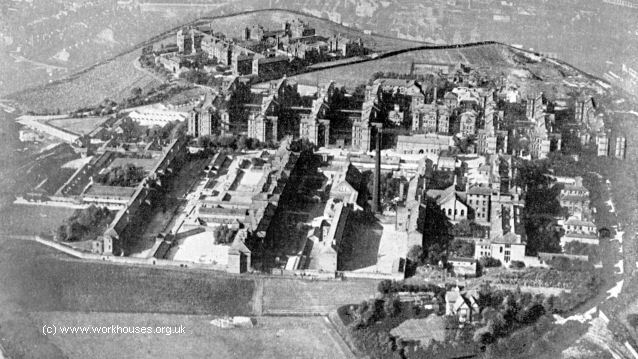 The 1920s aerial view below shows the Crumpsall site viewed from the south, with the workhouse in the foreground, the infirmary at the centre, and the Prestwich Union workhouse in the background. Manchester Crumpsall infirmary administration block, 2000. Manchester Crumpsall infirmary pavilion blocks from the north, 2000. After the erection of the infirmary, a new laundry was built to serve both it and the workhouse. Manchester Crumpsall laundry block (right), 2000. Another surviving building is the Master's residence, a little way to the south-west the main block. 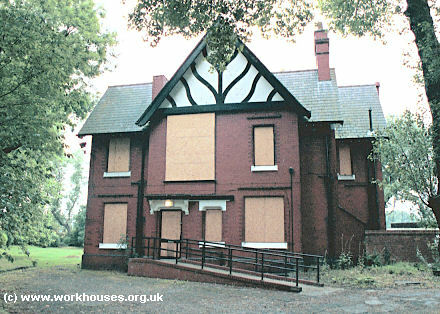 Manchester Workhouse Master's house, 2000. 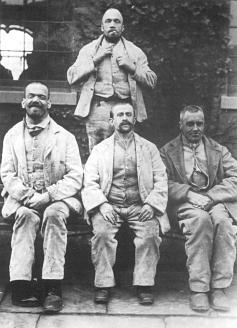 Manchester workhouse male inmates, 1890s. 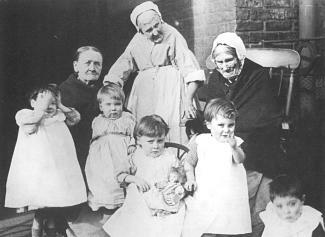 Manchester workhouse inmates old and young, 1890s. Manchester clay pipes recovered from the stone yard, 2000. From 1904, to protect them from disadvantage in later life, the birth certificates for those born in the workhouse gave its address just as 123 (later 223) Crescent Road, Crumpsall. In 1915, the Poor Law Unions in the Manchester area underwent a major re-organization, with the South Manchester (formerly Chorlton) and Prestwich Unions amalgamating under the control of the Manchester Board of Guardians. As part of this change, the Crumspall site was renamed the Crescent Road Institution. By 1930, the Manchester Union had its own fleet of eight ambulances. Manchester Union ambulance fleet, c.1930. The enlarged Manchester Union adopted the former Chorlton Union offices on Grosvenor Square. 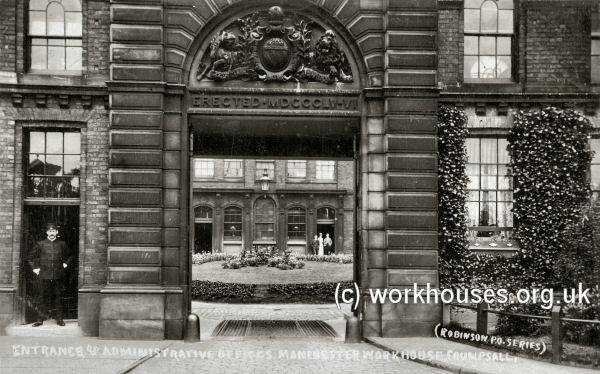 With the official abolition of workhouses in 1930, the Manchester workhouse came under the management of the Manchester Public Assistance Committee, while the infirmary came under the Hospitals sub-committee of Public Assistance Committee. Now known as Crumpsall Institute, the former workhouse, which had always had its share of lunatic inmates, started to become a centre for treatment of the mentally ill. Crumpsall Institute was renamed Park House in 1939, and with the introduction of the National Health Services in 1948, became Springfield Hospital. Manchester was one of the first unions to set up a large separate institution specifically for pauper children. The building, erected in 1843-5 at Swinton, was designed by Richard Tattersall. It was a long three-storey T-shaped building, with two tall towers and Dutch gables. Separate Anglican and Roman Catholic chapels were erected at either end of the site. 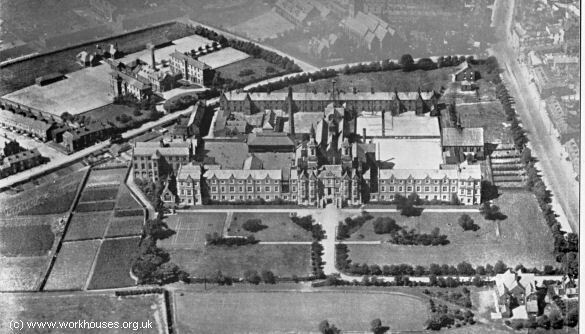 Swinton Industrial School from the east, c.1910. ... a building which is generally mistaken for a wealthy nobleman's residence. The structure is not only elegant but extensive ; it is in the Tudor style of architecture, with a frontage of four-hundred and fifty feet. It is studded with more than a hundred windows, each tier so differing in shape and size from the others as to prevent monotonous uniformity. Two winding flights of steps in the centre lead to a handsome entrance hall, above which rise two lofty turrets to break the outline of the extensive roof. The depth of the edifice is great — its whole proportions massive. Pleasure-gardens and playgrounds surround it. In front an acre and a half of flower-beds and grass-plots are intersected by broad gravel-walks and a carriage-drive. Some more of the land is laid out for vegetables. Beyond is a meadow, and the whole domain is about twenty-two acres in extent ; all in good, some in picturesque, cultivation. Swinton, too, was visited by Poor Law Inspector Mr R.B. Cane in August 1866 and received a glowing report: "I believe the school to be an admirably well-managed establishment in every respect. It was in excellent order throughout." At the 1881 census, the school had 799 inmates aged between 5 and 15, and 30 staff. Swinton Industrial School from the south-east, c.1902. 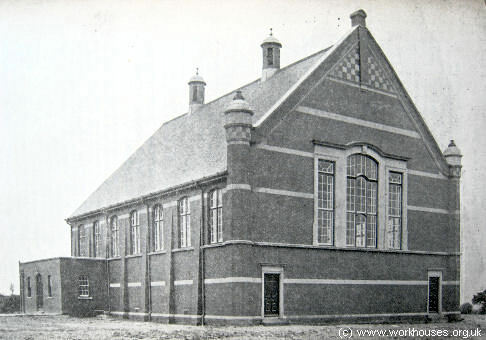 Swinton Industrial School from the south-east, c.1905. Like many establishmnets of its type, the school had a military-style boys' band. 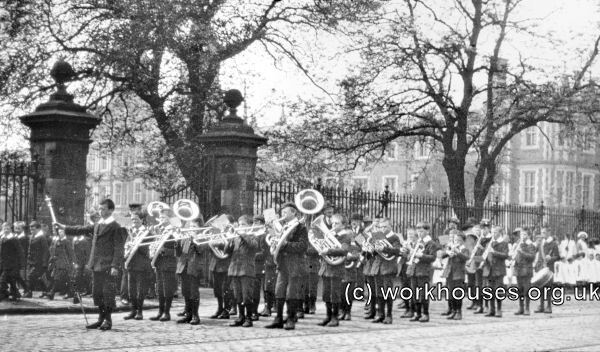 Swinton Industrial School boys' band, 1920. 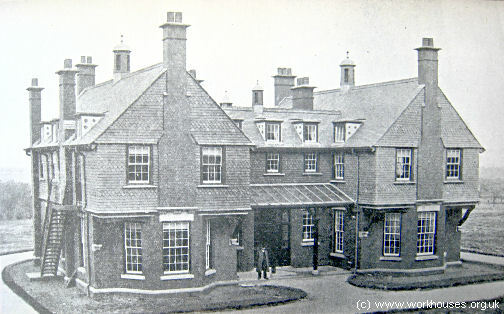 A subsidiary establishment known as the Swinton Home was later added at the west of the school site. It provided accommodation for mentally defective children and for those suffering from the after effects of "sleepy sickness". The Swinton buildings were demolished and replaced by a town hall in the 1930s. 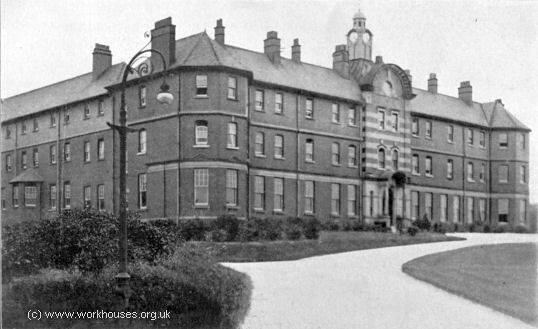 The union operated a children's convalescent home at Rose Hill near Northenden, an old house formerly used a school for children suffering from ophthalmia. The home could accommodate up to 120 cases. Manchester Rose Hill site, 1933. 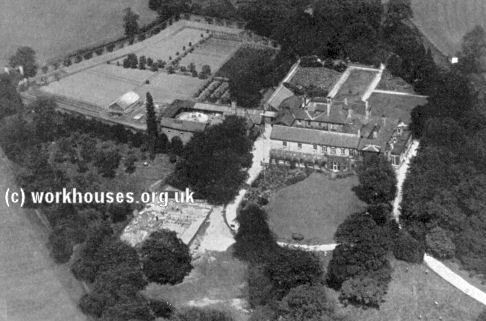 Rose Hill convalescent home from the south-west, c.1929. 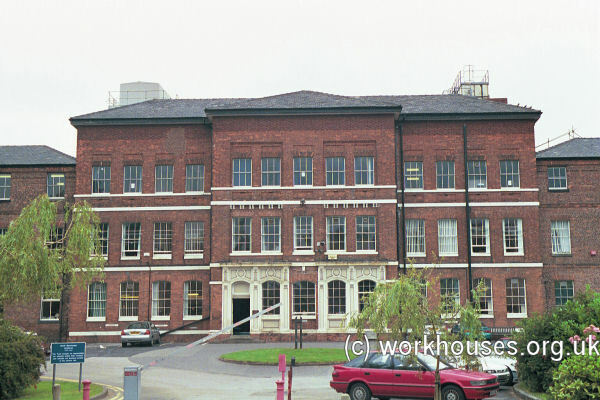 In 1897, the Manchester and Chorlton unions jointly set up a labour-test workhouse and casual ward at Tame Street, Ancoats, in a former cotton mill. The premises were rebuilt in around 1900 after being burnt down. Manchester Tame Street site, 1905. Manchester Tame Street casual wards and tower of administrative block from the south, c.1930. By the late 1920s, Tame Street was one of the largest casual wards in the country, with an average of 450 casuals sleeping there each night. In 1906, again in collaboration with Chorlton union, Manchester set up a "colony" for the treatment of patients suffering from epilepsy. The colony was situated on a 166-acre estate at Langho in Ribblesdale, with its entrance on the Clitheroe to Preston Road. Langho colony aerial view from the east. Langho colony administrative block from the north-east, c.1907. Langho colony administrative block from the north-east, c.1929. Residents were accommodated in a number of homes, each of which housed forty inmates. A Langho colony patients' house, c.1907. Langho colony recreation hall, c.1907. 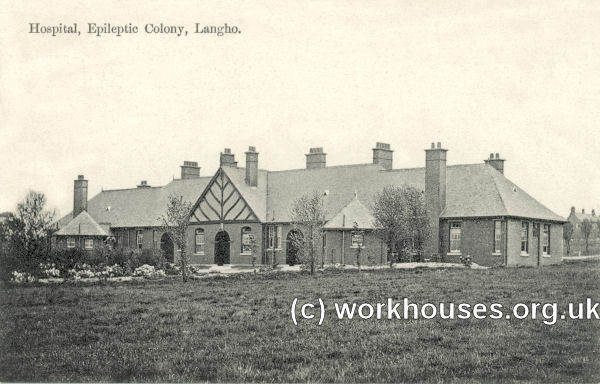 The Langho site is now a mental health centre known as Kemple View and many of the original building are still in use. Langho former colony patients' house, 2012. Greater Manchester County Record Office (with Manchester Archives), Archives+, Manchester Central Library, St Peter's Square, Manchester M2 5PD. The few surviving holdings include: Workhouse admissions and discharges (1841-5); Creed registers (1881-1914, with gaps); Lists of children sent to Swinton Industrial School (1846-64); etc. Lancashire Record Office, Bow Lane, Preston, Lancashire, PR1 2RE. 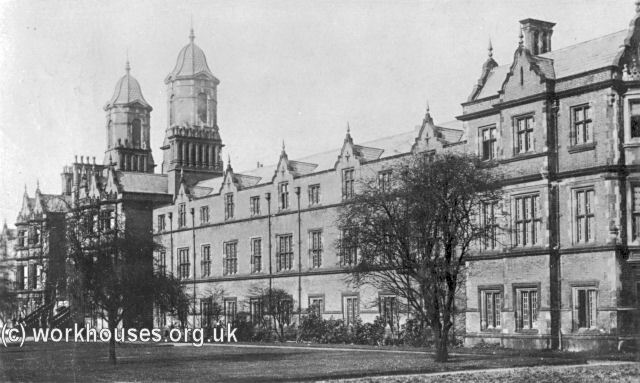 Swinton Industrial School admissions and discharges (1846-8, 1850-1934); indexes (1848-1935); etc. Guest, AE (1961) Swinton Industrial Schools — A Historical Sketch and Personal Reminiscences.